Flexible Conduit. 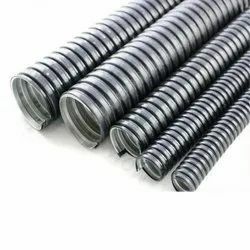 Offered array of products consists of Flexible Conduits Accessories, Aluminum Flexible conduit and GI Steel Flexible Conduit. To manufacture these products in full compliance with the set industry norms, our professionals consider only optimum grade raw material given by the trusted and certified suppliers of the industry. We are offering these products in various technical specifications to suit the diverse application needs of our precious customers. We are the leading supplier of Flexible conduit heavy duty made from high quality material at competitive prices. Offering you a complete choice of products which include Flexible Conduits Accessories such as Conduit accesories, Zinc Dye Casting Coupling, SS Conduit Gland, Cable Glands, Brass Lock Nuts & Stopping Plugs, Brass Reducer & Enlargements and many more items. Electrical metallic tubing (EMT), also commonly called thin-wall, is a listed steel raceway of circular cross section. Covered by Article 358 of the NEC, EMT is available in trade sizes 1/2 through 4. The outside is galvanized for corrosion protection and the inside has an approved corrosion-resistant organic coating. 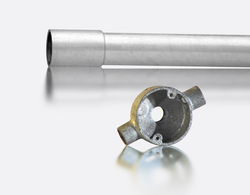 EMT is installed by use of set-screw or compression-type couplings and connectors. It is permitted to have an integral coupling comprised of an expanded, “belled” shape tube on one end with set screws. EMT with integral couplings is available in trade sizes 1-1/4 through 4. EMT is covered by Article 358 of the NEC®. 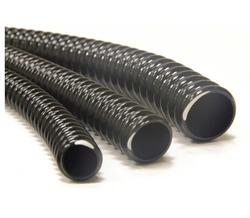 Looking for GI Flexible Conduit Pipes ?